A large body of research argues that the returns to public investment in the U.S. economy are likely very large—substantially larger than the returns to most forms of private investment (see Bivens 2012 for a compilation of this evidence). However, some question whether the high rates of return generally estimated for “core” infrastructure investments—generally roads, bridges, other transport-related projects, and water treatment systems—are applicable to other forms of public investment. Education: Rigorous research has demonstrated that investments in both educational facilities and in providing high-quality pre-kindergarten education would yield extraordinary returns. Each $1 spent improving marginal educational facilities leads to $1.50 in economic value. 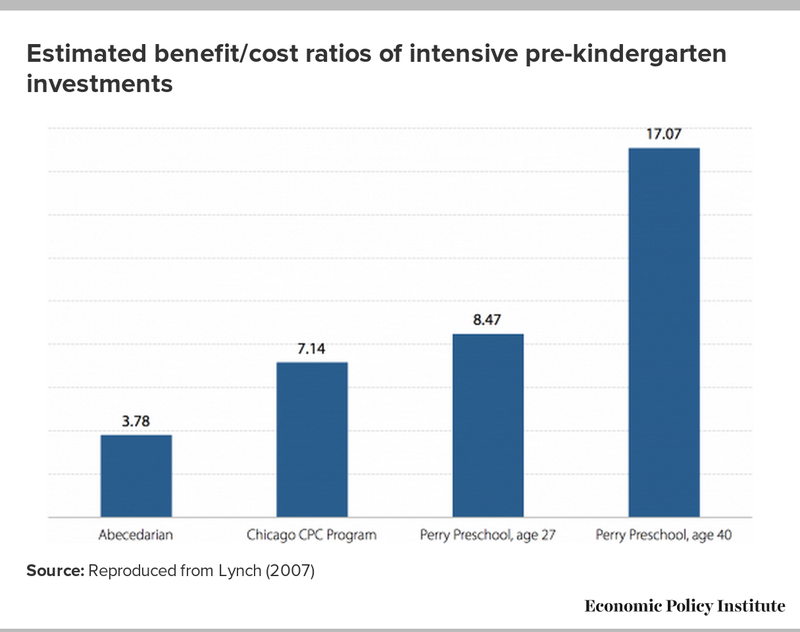 Even more striking, investments in universal high-quality pre-kindergarten can carry eventual benefit-to-cost ratios as high as 8-to-1. Health care: Taking more of the nation’s health care financing onto the public-sector balance sheet would lead to a reduction in the rate of health care cost growth that cumulates over time. If private-sector insurers had been able to match Medicare’s (still-insufficient) success in controlling per-enrollee costs since 1970, the average employer-sponsored family health insurance policy in 2010 would have cost $10,000 instead of $15,000. This would allow American workers to pocket the savings as increased cash wages. Green investments: All serious policy proposals to stop global climate change contain calls for very large investments in both energy efficiency and renewables. A widely circulated report by McKinsey (2009) argues that investments in energy efficiency have benefit-to-cost ratios as large as 2-to-1, but are often blocked by market failures. Thus, public financing and policy changes are key to fully exploiting these gains. Overall, among investments in education (both in educational facilities and in early childhood education), health financing, and green investments, are literally hundreds of billions of dollars of potential public investment that economic research indicates would yield very high rates of social return. To be clear, the case for increasing public investment should generally rest on the increase to long-run potential output it provides. As Bivens (2012) explains, public investment by federal, state, and local governments builds the nation’s capital stock by devoting resources to basic physical infrastructure (such as roads, bridges, rail lines, airports, and water distribution), innovative activity (e.g., basic research), green investments (such as clean power sources and weatherization), and education (both primary and advanced, as well as job training), thereby leading to higher productivity and/or higher living standards over the long term. But in those circumstances (like the present) where the economy is severely demand-constrained, quick increases in public investment effort carry the very substantial knock-on effect of pushing the economy closer to its potential in the short run. Calls for increased public investment in education have proliferated in recent years. Two forms of education spending would have particularly high returns to investment: increased investment in educational facilities, and increased investment in high-quality early childhood education. The American Recovery and Reinvestment Act (ARRA) included substantial state aid directed to education. However, nearly $30 billion in state aid dedicated to investments in school construction and renovations was stripped out of the bill before final passage. In response, the Fix America’s Schools Today (FAST) proposals advanced by Filardo, Bernstein, and Eisenbrey (2011) called for dedicating $35 billion in federal aid to states for investment in educational facilities. This problem of underinvestment in school facilities became particularly acute in the 2000s: Between 2001 and 2007, student enrollment increased 3 percent, but real (inflation-adjusted) spending on school maintenance and construction fell 42 percent, from $35 billion to just over $20 billion (Pollack 2008). This underinvestment imposes significant costs in terms of student achievement. In a fall 2005 Department of Education survey, 43 percent of schools reported that the condition of their facilities “interferes with the delivery of instruction,” with complaints about heating and air conditioning being the most common (U.S. Department of Education 2007). Furthermore, the Department of Education and the Environmental Protection Agency have reported that “poor environments in schools due primarily to effects of indoor pollutants adversely influence the health, performance, and attendance of students” (Mendell and Heath 2004). Cellini, Ferreira, and Rothstein (2010) have made what is likely the most sophisticated attempt to estimate the actual economic return to investment in school facilities. Using data from referenda on bond issues targeted to funding capital expenditures, they specifically examine the difference between those school districts where these referenda narrowly passed and those where they were narrowly defeated. By examining only the narrow range just above or below the pass/fail threshold, this research design (sometimes called a “regression discontinuity” technique) effectively neutralizes many other factors that drive variations in school facilities investment. This enables a relatively clear estimate of the “causal” effect of school investments on economic outcomes. Their hypothesis, based on standard models of local public goods, suggests that if school districts have indeed underinvested in school facilities, an expansion of these investments should increase local housing prices because the value of better school facilities is capitalized into these home prices. Using a California dataset, they find that passing a referendum that directs public investments toward school facilities leads to an “immediate, sizeable increase in home prices,” implying that each $1 of increased capital spending leads to a $1.50 increase in the willingness of marginal home buyers to pay for housing. They also find that these investments in school facilities lead to improvements in student test scores. 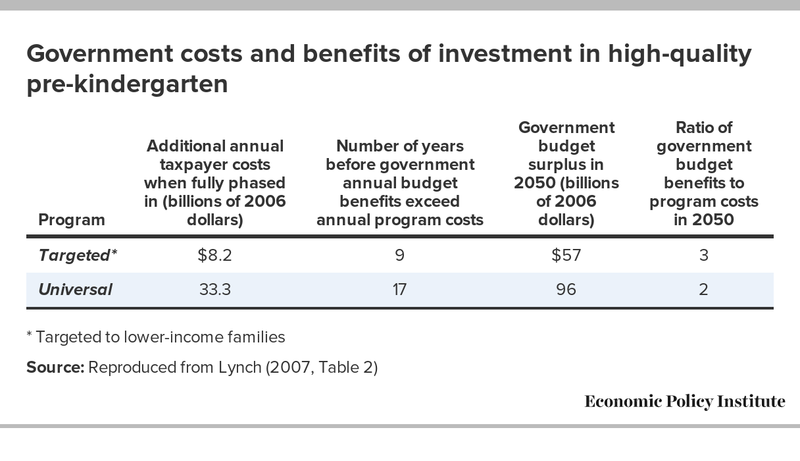 Perhaps the most comprehensive accounting of the costs and benefits of a large-scale campaign to provide high-quality early childhood education is a research study by Lynch (2007) that documented the returns to investments in high-quality pre-kindergarten programs for three- and four-year-olds. 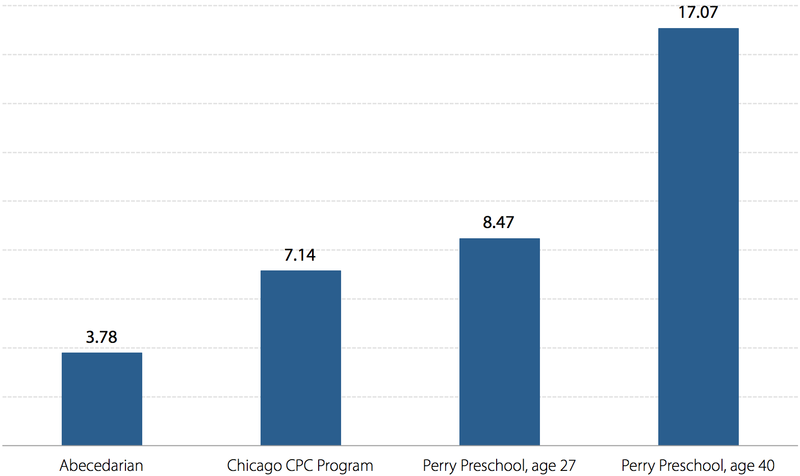 Lynch estimates both benefits and costs of these early childhood investments by undertaking a substantial review of the economic literature, as well as by extrapolating the findings from various past investments in pre-kindergarten programs—including the nationwide Head Start program as well as more intensive efforts made by state and local governments, such as the Perry Preschool Project and the Chicago Child-Parent Centers program. Lynch finds that a nationwide investment in universal high-quality early childhood education (UHQECE) would cost roughly $50 billion (in 2011 dollars) annually, or about one-third of 1 percent of the nation’s GDP. The benefits would be large and multidimensional and would include increased lifetime earnings of participating students due to improved labor market outcomes, reduced social costs from crime (as expanded early childhood education decreases the probability that exposed students will commit crimes later in life), and increased tax revenue (as students’ better labor market outcomes eventually translate into higher taxable incomes). In all, the annual benefits-to-cost ratio in 2050 would be roughly 8-to-1. 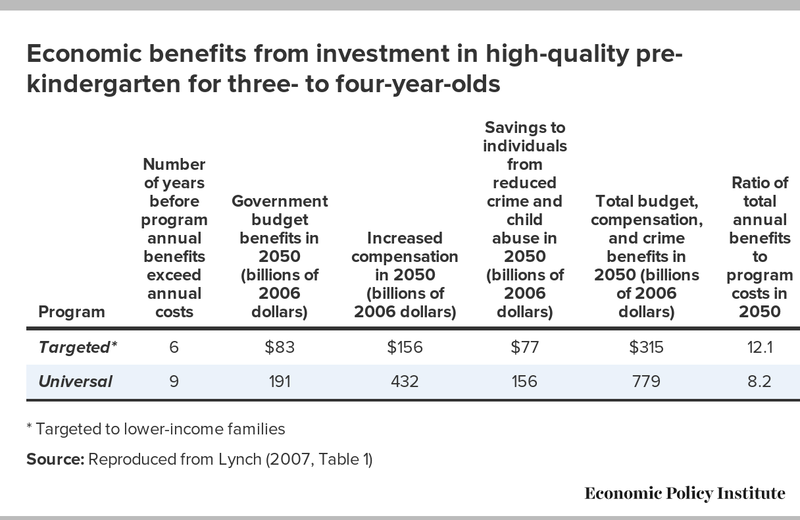 Lynch also identifies the benefits from investment targeted to lower-income families. While less ambitious (costing roughly one-fourth as much as universal investment), it would yield higher benefits, as middle- and high-income children are likely to already receive higher-quality educational development in their pre-kindergarten years. Lynch also finds that by 2050, targeted UHQECE investment of roughly $50 billion per year (in 2011 dollars) would yield annual benefits roughly 12 times the outlays. Table 1 summarizes the economic benefits of both the targeted and universal approaches. The evidence compiled by the Department of Education on the barrier to student achievement posed by inadequate facilities, combined with the clear link between students’ educational achievement and subsequent economic success, clearly implies substantial returns to public investment in educational facilities. The Cellini, Ferreira, and Rothstein (2010) finding on the value of school improvements that are capitalized into home prices similarly indicates that investments in school facilities are severely underprovisioned—and that expansions would yield high social returns. Finally, extremely well-documented evidence about investments in UHQECE indicates that very substantial resources could be directed toward this endeavor and yield sizable returns. In fact, the evidence compiled by Cellini, Ferreira, and Rothstein (2010), as well as Lynch (2007), indicates strongly that substantial public investments in education could even be self-financing in strict budgetary terms over the long run. Of course, budgetary impacts should be just one (relatively small) consideration in the overall evaluation of the worth of public investments; even if the narrow budgetary costs are negative in the long run, it would seem shortsighted to forgo them. Health care provides perhaps the clearest case of traditional conceptions of public investment—which essentially count just core infrastructure as productive public capital—being far too limiting. First, the evidence is clear that public spending on care that leads to a healthier population and workforce has obvious economic payoffs in the form of an improved stock of human capital. Second, investments in information technology and other types of health care–provider infrastructure can potentially save large amounts of money by allowing providers to work more productively. Currently, the fractured nature of the private health market serves as a barrier to making such investments profitable for providers. For example, BlueCross may lack an incentive to substantially invest in making a customer’s health history available in electronic form and online if she is likely to switch to Aetna in a couple of years when she changes jobs. The American Recovery and Reinvestment Act (ARRA) provided a substantial increase in public financing of health information technology, which is likely to pay large dividends in the future. Third, much basic medical research that is not carried out (or is not done well or is done at an insufficient scale) by the private sector offers significantly higher returns than most private-sector investments. This is why, for example, the National Institutes of Health exists and accounts for nearly a third of all U.S. biomedical research. ARRA provided over $1 billion in additional funding for basic research on the comparative effectiveness of different medical treatments to determine which provide the best results. Most important, however, is that the public sector has a clear comparative advantage in providing social insurance of nearly all kinds—particularly when it comes to financing and purchasing health care. This can be seen most clearly when comparing the largest public-sector health program—Medicare, which covers nearly 50 million, mostly elderly, Americans—with private health insurance providers over the past 40 years. 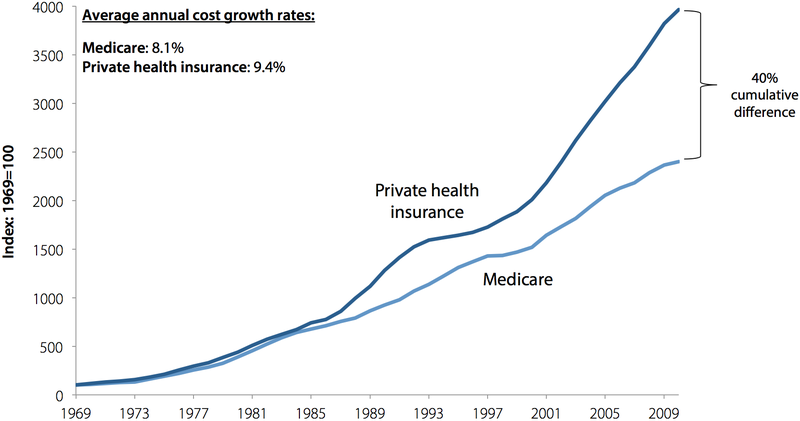 As Figure B shows, cost growth in Medicare was slower by a cumulative 40 percent between 1970 and 2010. 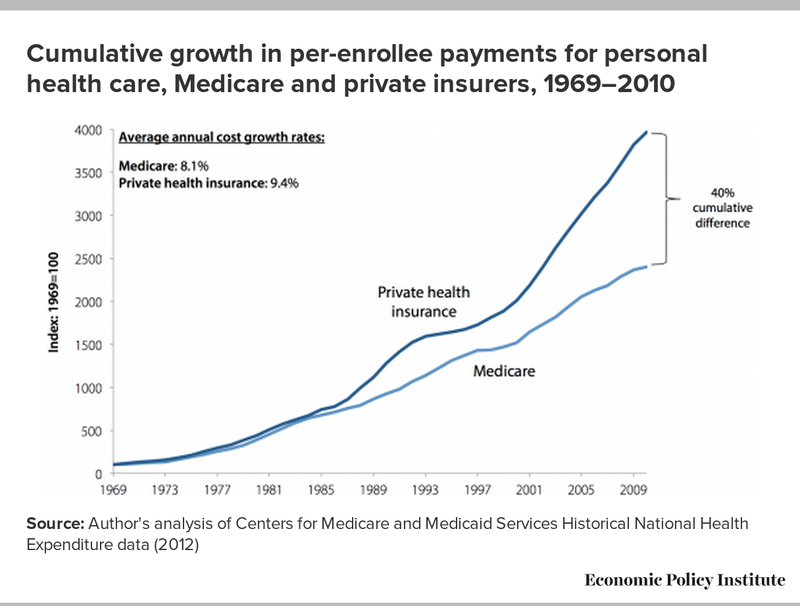 If the private sector had restrained growth as effectively as Medicare over this time, the average family health insurance plan provided by employers in 2010 would have cost roughly $5,000 less ($10,000 instead of $15,000). In addition, total health spending as a share of GDP would be 2.3 percentage points lower. The public sector’s cost advantage in financing and purchasing health care is also reflected in the cost savings the Congressional Budget Office estimated would have resulted had a “public option” been included in the health insurance exchanges created by the Affordable Care Act. Roughly half of all American health expenditures are undertaken by a private sector that, on average, provides this health care at greater cost. This implies that there is a large scope for increasing the efficiency of health care provision by taking more of it onto public-sector balance sheets. This could be achieved with the introduction of a public option in the new health insurance exchanges. Also, government could assume a larger role in testing the effectiveness of pharmaceuticals and medical devices in exchange for placing the technology behind these products in the public domain—allowing U.S. households to save billions in patent rents they currently pay to private pharmaceutical and device-making companies. This idea, first proposed by the Center for Economic and Policy Research’s Dean Baker, could save U.S. households up to $280 billion over 10 years (Baker 2008). In short, there seem to be very large returns to having the public sector take on more of the nation’s health spending, even if health spending is almost universally recorded in national income accounts as a current expenditure rather than an investment. Energy efficiency and renewable energy present another promising area for increased public investment. By far the most compelling reason to undertake an aggressive public investment campaign focused on energy efficiency and renewables—i.e., increasing so-called green investments—is the threat of global climate change caused by the emission of greenhouse gases. The Stern Review on the Economics of Climate Change (Stern 2006), a report commissioned by the British government and chaired by economist Nicholas Stern, undertook a review of the literature on climate change economics and calculated that climate change could cost the world economy 5 percent of total GDP each year (in present value terms). (As a point of reference, the Great Recession caused the U.S. economy to contract by 5 percent of U.S. GDP in 2009.) While professional economists have criticized various elements of the 700-page Stern Review, most of those critics concede that the potential damage from climate change could be extraordinarily large if left unaddressed (for example, see Weitzman 2009). All scientifically based strategies aimed at slowing the growth of greenhouse gas emissions rely strongly on energy efficiency and a move toward renewable electricity generation. For example, Pacala and Socolow (2004) identify 15 “potential wedges” for slowing emissions; if adopted, each of the policies represented by these wedges would prevent the emission of 1 billion tons of carbon dioxide over the next 50 years. Six of these 15 wedges directly involve investments in energy efficiency (excluding energy-efficient vehicles) and a switch to renewables. Romm (2009) argues that roughly 75 percent of a comprehensive strategy to stabilize greenhouse gas emissions at non-catastrophic levels over the next 50 years will rely on non-vehicle energy efficiency investments and the switch to renewables. Finally, both McKinsey (2009) and Rogers (2007) also make compelling suggestions for how to overcome these problems. While neither plan relies even predominantly on purely public investments, both realize that substantial upfront financing is needed to jumpstart such an energy efficiency program, and suggest public financing to get it started. Rogers (2007), for example, suggests the creation of a new kind of coordinating entity (which he labels E2s, for “energy efficiency”) that would serve as a locus between banks, utilities, governments, and end users in order to solve many of the market failures that currently block large-scale efficiency investments. These E2s could be government entities, but even if they are not, they would surely need public financing to get up and running. Fortunately, these goals seem eminently achievable. Since 1970, U.S. GDP has roughly tripled, yet three-fourths of the rise in energy requirements over that time has been met by increased energy efficiency, not additional fuel use (McKinsey 2009). A growing body of research indicates that the future promise of energy efficiency is even greater. A similar story holds for the role of renewable energy sources; the last decade has seen a large increase in the cost competitiveness of both wind and solar power generation, even absent any U.S. policy move to make greenhouse gas emissions more costly. Further, these increases in clean power generation have consistently outpaced projections. In 2000, for example, the International Energy Agency (IEA) projected there would be 30 gigawatts of wind power worldwide by 2010 (IEA 2000), but actual wind power capacity that year was 200 gigawatts (REN21 2012). In 2000 the IEA also projected that 3 percent of global energy would come from renewable sources (excluding hydropower) by 2020 (IEA 2000)—when in fact this benchmark was surpassed in 2008 (REN21 2012). The primary policy tool recommended by economists to address climate change—one that would spur greater use of renewable energy sources and would lead to more efficient energy use—is raising the cost of (currently free) greenhouse gas emissions. This could be achieved either through a direct tax or quantity restrictions (be they imposed through regulation or an overall cap accompanied by tradable credits granting the right to pollute). The economic case for carbon pricing is too often shorthanded as aiming to reduce final demand for emissions-intensive activities: Make gasoline expensive, and people will drive less. However, equally important is the effect of carbon pricing on increasing investments in technologies (such as renewables and methods of increasing energy efficiency) that lead to reduced emissions. The degree to which a given increase in the cost of emissions leads to an actual reduction in emissions is driven largely by the responsiveness of both final demand for emissions-intensive goods as well as the spur to investments in low-emissions production provided by the higher price. Many policy levers can be used to attempt to make investments in low-emissions production more responsive to carbon pricing (or to other policy measures that make emissions more costly). However, the most direct lever is simply to undertake the investments directly. This investment channel is too often underappreciated in the weight it pulls in having overall emissions respond to changes in their relative expensiveness. Rezai, Foley, and Taylor (2009) note that the primary reason for the large economic damage stemming from the unpriced emission of carbon is the absence of social institutions making investment in carbon mitigation profitable. The failure thus far to increase the cost of carbon emissions by assigning a price to their resulting externalities is a key barrier preventing investments in energy efficiency and renewables from being economically viable for private, profit-seeking entities. But we know that such investments carry very high social returns, and that expanded investments in both constitute a primary benefit of proposals to raise the cost of emissions. This suggests that there is no need to wait for policy changes to raise the cost of emissions before undertaking these investments; they simply need to be financed publicly, rather than relying solely on private investment to carry them forward. The benefits of not waiting for this externality to be corrected before moving forward with investments in renewable energy generation and energy efficiency are perhaps best captured by recent groundbreaking work by Muller, Mendelsohn, and Nordhaus (2011), who measure the economic damage caused by unpriced externalities in various sectors. They find that the utility sector generates more economic damage through pollution than any other—$63 billion in “gross external damage” annually. They also find that some modes of power generation (particularly coal- and oil-fired power plants) result in marginal damage that far exceeds marginal value-added; they also have ratios of economic damage to value-added higher than those of any other sector. This suggests that investments that allow coal- and oil-fired power production to be replaced with non-emitting renewable production could prevent tens of billions of dollars’ worth of economic damage. It is worth noting that what are clearly in theory high-return efforts to mitigate emissions—efforts that are possible even absent any policy to raise the cost of emissions—are thought to be blocked by market failures unrelated to the simple unpriced externality failure already discussed. Furthermore, to the degree that complementary investments make the expenditure-switching from emissions-intensive goods and services (e.g., single-car commuting) to less-emissions-intensive activity (e.g., commuting on public transport) easier and less disruptive (e.g., by making public transport more pleasant and convenient), they will lead to larger emissions reductions. This would increase the “bang-for-the-buck” of policies directly aimed at increasing the cost of emissions. Given that failing to invest in emissions mitigation results in less emissions reduction and may be the result of numerous market failures, a clear policy corollary emerges: Ensure that some mitigation investments are funded publicly. 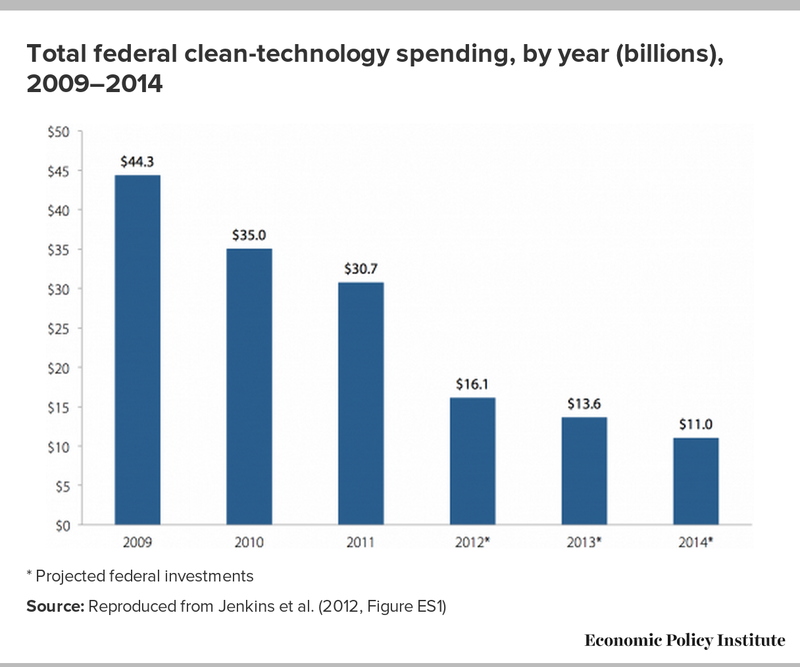 While the American Recovery and Reinvestment Act provided for substantial green investments, federal support for clean technology has declined rapidly in recent years as the money allocated by ARRA has dried up. This trend is expected to continue over the near term, as Figure C illustrates. A number of studies strengthen the case for public financing of “green investments” by noting the high return to energy efficiency investments. Perhaps the most exhaustively documented is a much-discussed report from McKinsey (2009). In their 165-page report, the authors argue that a range of energy efficiency investments would actually have negative net costs when measured as the cost per ton of greenhouse gas emissions mitigated. 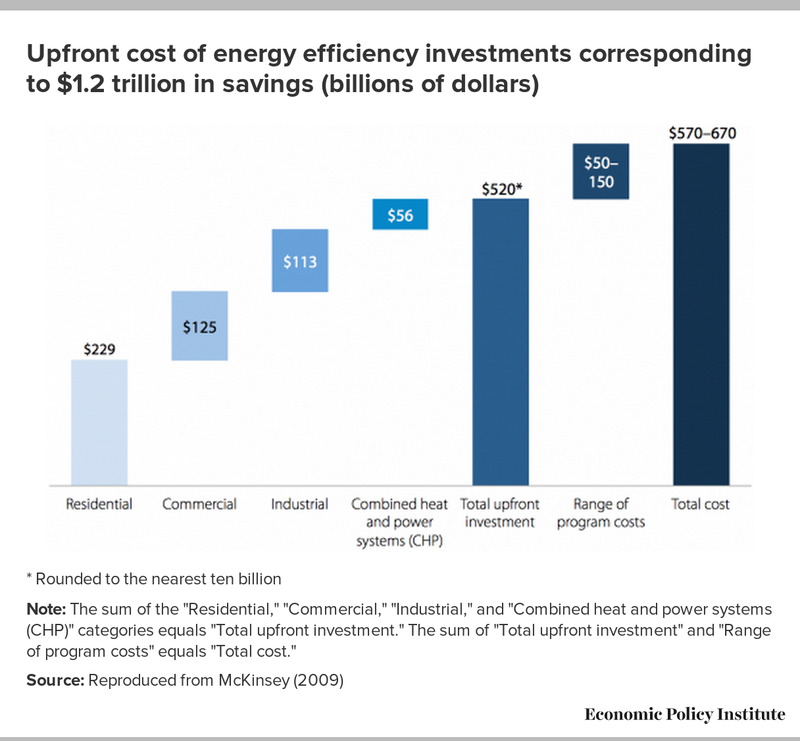 As shown in Figure D, the bulk of the investments in U.S. energy efficiency that remain unmade due to market failures are centered in the residential sector; much larger efficiency gains have already been made in the industrial and commercial sectors. 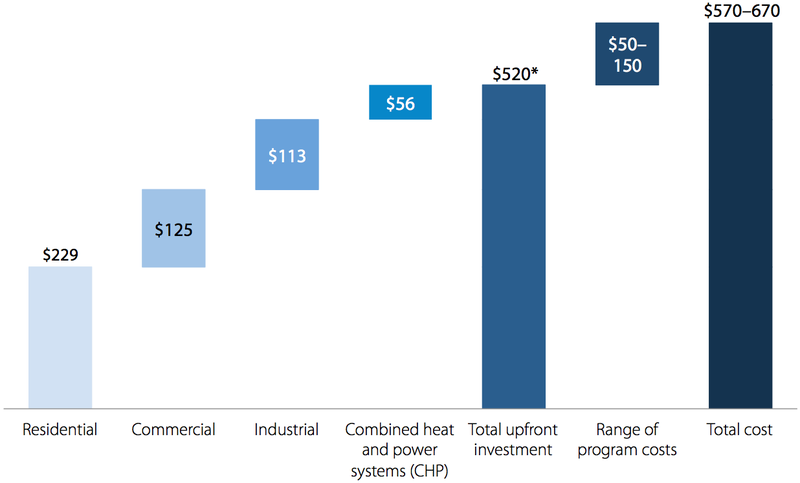 Note: The sum of the "Residential," "Commercial," "Industrial," and "Combined heat and power systems (CHP)" categories equals "Total upfront investment." The sum of "Total upfront investment" and "Range of program costs" equals "Total cost." 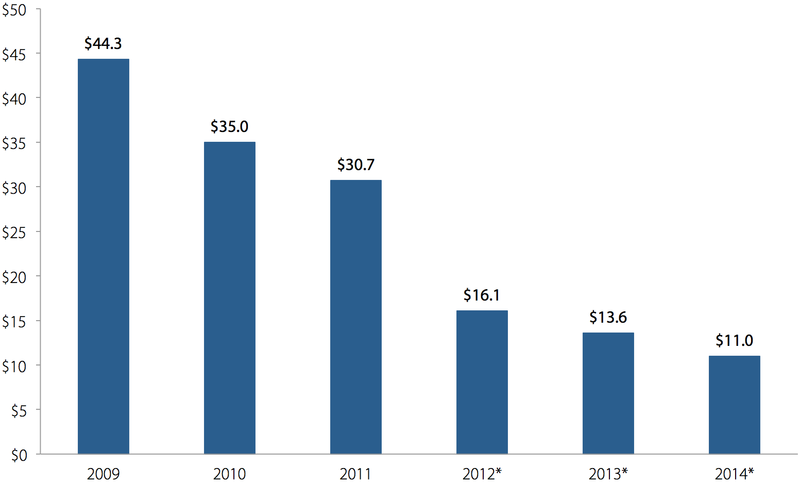 Besides the composition of this spending, the figure reinforces that the scope for high-return investments is large. The McKinsey authors argue that roughly $520 billion in investments made through 2020 (thus averaging well over $60 billion per year) could reduce energy demand by 23 percent and yield savings of $1.2 trillion, implying a benefit-to-cost ratio of well over 2-to-1. The more than 2-to-1 benefit-to-cost ratio over the horizon identified by McKinsey, combined with their assumption of a 7 percent annual discount rate (the rate at which alternative uses of the upfront investments could have grown over the time horizon), implies a rate of return of well over 15 percent for the full package of $520 billion in investments. This is far in excess of the expected rate of return for marginal returns on private investments, and a rate actually in line (if on the low end) with the extraordinarily high rates of return documented for public investments in core infrastructure. Further, the very large potential identified by McKinsey for energy efficiency investments to address global climate change makes no assumption about future prices being imposed on carbon and other greenhouse gas emissions. If policy did manage to increase the cost of emissions, the scope for high-value investments would naturally increase, as the savings gained from greater efficiency would grow. They find that a carbon price as high as $50 per ton (well under most research estimates of the full economic cost of these emissions) would boost the savings from efficiency investments by 13 percent. This would provide the scope for another $53 billion in high-value public investments in energy efficiency over the next 10 years. The economics literature is clear that public investments often result in substantial economic returns, and recent U.S. economic history shows a failing effort to maintain the country’s public capital stock. These findings have led some (see Bivens 2012) to argue that expanded public investment should be a key driver of potential output growth in coming decades. Often, however, calls to increase public investment are criticized on the grounds that too much public spending is classified by advocates as “investment” when it actually should be treated simply as consumption expenditures. In fact, the findings presented in this paper demonstrate that the opposite is true; current accounting conventions actually fail to classify enough public spending as investment, even in instances such as education, health care, and green investments, where expenditures lead to particularly efficient and productive economic outcomes. These insights are important enough on their own but become particularly relevant in a political climate where the primary economic debate is over how to reduce budget deficits. The entire economic rationale for addressing budget deficits is that they might reduce private investments, which are often viewed as particularly productive. It would thus be perverse indeed to cut public investment—which is often more productive than private investment—in order to reduce deficits. Unfortunately, this fact has yet to bear heavily on the debate. —Josh Bivens joined the Economic Policy Institute in 2002 and is currently the director of research and policy. His primary areas of research include mac­roeconomics, social insurance, and globalization. He has published two books while working at EPI, edited another, and has written numerous research papers, including for academic journals. He appears often in media outlets to offer eco­nomic commentary and has testified several times before the U.S. Congress. He earned his Ph.D. from The New School for Social Research. —The author would like to thank Hilary Wething, who provided valuable research assistance in preparing this report. —This research was made possible by generous support from the Rockefeller Foundation and the Ford Foundation. 1. In later work, Heckman re-estimates the rates of return to the Perry Preschool Project and finds slightly lower rates of return than he identifies in this study, but he notes that even these lower re-estimates indicate social rates of return that remain substantial (from 7 to 10 percent, with benefit-to-cost ratios of roughly $2–8 to $1, depending on the chosen discount rate). He notes further that these rates of return are significantly different from zero for both male and female students (Heckman et al. 2009). Further, it should be noted that the Lynch results reported later in this section rely on estimates from the Perry Preschool Project as well as other intensive high-quality pre-kindergarten investments. Lynch, Robert G. 2007. Enriching Children, Enriching the Nation: Public Investment in High-Quality Prekindergarten. An Economic Policy Institute book. Washington, D.C.: Economic Policy Institute. Muller, Nicholas Z., Robert Mendelsohn, and William Nordhaus. 2011. “Environmental Accounting for Pollution in the United States Economy.” American Economic Review, vol. 101, no. 5, pp. 1649–1675.